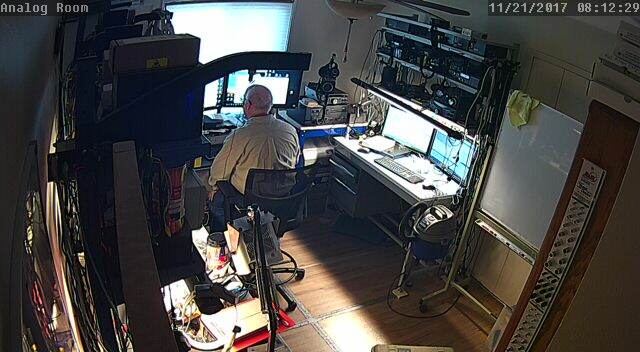 The shack is where most Amateur radio operators spend their time. In my case, and my Wife will attest, a large portion of my time. This is a view into my world. I am a “native” New Mexican arriving in Albuquerque the year the Beatles came to the United States. I have connections dating from Elementary School to the present where I am an Engineer at a local company. I began my career in the aerospace industry (as a College co-op student) working on the Atlas Centaur rocket (General Dynamics), the Galileo space probe (TRW). After receiving my BSEE from New Mexico State University (NMSU) in 1982, I started at Texas Instruments as an Integrated Circuit Design Engineer where I designed 10 or so members of the 74HCxx logic family integrated circuits. I left TI, later, at went to National Semiconductors where I was a product Engineer responsible for the COPs 4-bit NMOS microcontroller product line. I decided to return to my roots in New Mexico, in 1985, where I took a position with Signetics/Philips, as a Yield Engineer, and worked in various positions (Integrated Circuit Designer), Digital and Mixed Signal Test Engineer all at Signetics/Philips. I finally ended up at a local company, in Albuquerque, as a Software Engineer. I like to say I can design from “Silicon to Software”. My QTH is in the Uptown area of Albuquerque where, with the love of my life, my Wife Lisa, I garden, experiment with Electronics, and am living the dream. I’ve held a license in the amateur radio service since the 1990’s and, I am a licensed Extra Class Amateur Radio Operator. My interests include math, Physics, circuits and systems, mixed and digital IC testing, transmission line theory, RF, signal processing, Windows and Linux application programming, and gardening to name a few. Geez, I’m not sure what I want to be when I group up! I’m (slowly) moving my expertise into DSP and SDR combined with embedded systems (FPGAs/Zynq)? probably the next evolution). My Cushcraft R-9, shown here, is my main antenna. My shack has an assortment of Kenwood, Yeasu, and Alinco gear. I have two electronic work benches for my many projects, shown below. The work bench, pictured to the right, is my primary Amateur radio control point. The work bench, on the left (not visible), contains an assortment of power supplies, spectrum analyzers, AWG’s and other lab gear. I have been working towards a comfortable electronics environment all of my working career. This is a personal site. No professional or commercial affiliation of, or endorsement of, any company, individual, or individual is implied unless otherwise noted.